Price reduction! Above average condition! This is a must see MOTORSAILOR! Spent $180K on Complete REFIT including Twin 75 hp Yanmars in 2007. NEW Standing Rigging and NEW Electonics 2017. Currently docked in a transferable slip in Harbortown Marina in Fort Pierce, Florida. Designed with luxurious interior appointments and 3 cabin/2 head layout. Starting forward is the Guest Stateroom which has a double berth, an upholstered side seat and generous drawers and hanging locker space. To starboard is over/under bunk room which can also serve as a workshop. These cabins share a large head with separate shower stall on the port side. This forward section of the boat also houses the stacked washer/dryer as well as the door to the walk-in engine room. Up two steps is the full beam Main Salon which features a large U shaped settee with custom upholstery, a custom circular drop leaf dining table, semi circular end table. The high gloss teak and holly sole is new. 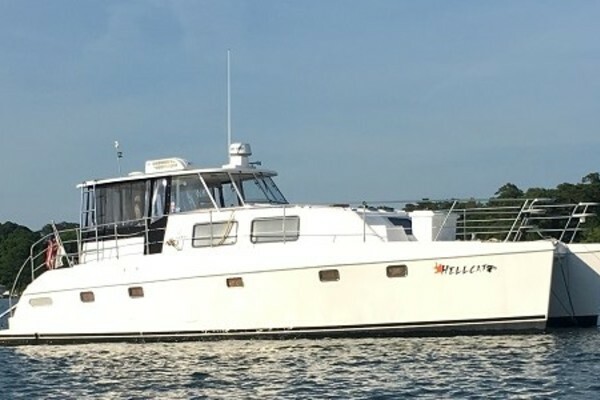 The port side boasts a marble top Entertainment center with wet bar and wine rack and 2 side chairs for lounging and an aft facing navigation station at the base of the companionway. The walk through galley to starboard has been fully re-fit and is equipped to please the most discriminating chef. The Master Stateroom can be accessed through the galley or from the separate door from the aft cockpit. This spacious Master cabin has an enlarged centerline queen bed, cedar lined lockers and plenty of dresser drawers and cabinets and ensuite head with shower stall.